As a new parent you quickly learn that timing is everything. You are no longer the boss and now, you are working around your little one’s schedule. If you had the luxury of time to spend on your hair before, you might be in for a rude awakening. Needless to say, dedicating time to my hair almost became an afterthought. It wasn’t until a couple weeks in that I managed to find the balance. Here’s how I do it. With my husband at work, it is just my little man and I trying to conquer the feedings, diaper changes, and his sleep schedule. It’s already difficult enough to get anything done when you’re a sleep deprived mom, so be sure that a lengthy hair ritual is worth sacrificing a nap for yourself. As soon as you learn your baby’s nap schedule, start the clock! Get an estimate of how long his naps are so you can realistically make time for not only your hair but other important motherly duties like sanitizing bottles, prepping their bath, or anything else that needs to be accomplished before your little one wakes up. Also, keep in mind that a baby’s schedule is always changing so invest in baby monitors to keep an eye on them. During the first few weeks, you may have relatives and friends that want to meet your little one. As long as you are comfortable, use part of their visiting hours to spend 30 minutes to yourself. More than likely, they are going to enjoy the extra time with the baby and you score some extra time for your curls! If your hair is long enough to place into a pineapple, this style can be a lifesaver. Not only does it look stylish but pineappling preserves your hair overnight so that you can wear it down the following day. My curls were in a pineapple from the minute I was in labor and stayed that way for almost two weeks. When visitors came around they had no clue that all I did was take down my pineapple and shook out my curls before they showed up. An easy protective style such as braids or twists gets me through a rough week with a fussy baby. A word of advice: do not over-complicate the style. If you only have time to add 2 braids, then so be it -- just find a style that you can complete in a short amount of time because you never know when your baby will wake up in a crying fit. At night, use a satin scarf to preserve the style for the next day. Bonus: The detangling done prior to braided and twisted styles can also make your wash day faster. Wash day can be tricky because of the extra time it takes to detangle my hair. Normally, detangling is done in the shower but by breaking up this process I spend less time in there. During one of the baby’s naps, prep your curls by making a few sections and spraying them down with water. Add conditioner to each section and gently detangle. Then, braid each section. If your baby hasn’t woken up yet, proceed to the shower but if you missed your opportunity, pop on a plastic cap and let the conditioner work it’s magic. Use the baby’s next nap as your chance to wash your hair. 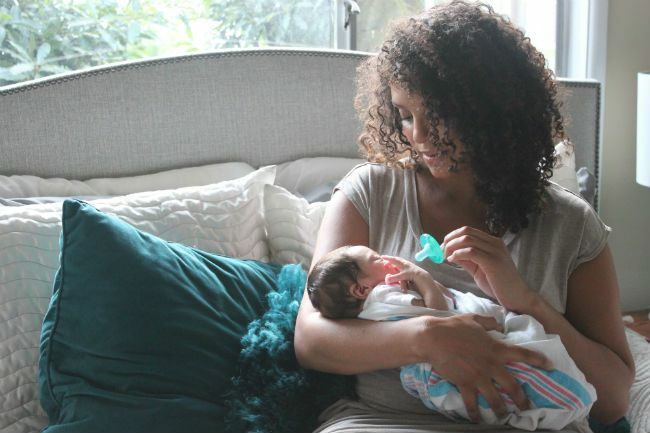 How do you care for your curls with a newborn? What hairstyles and hair tips have been lifesavers for you postpartum? Share with us down below in the comments.